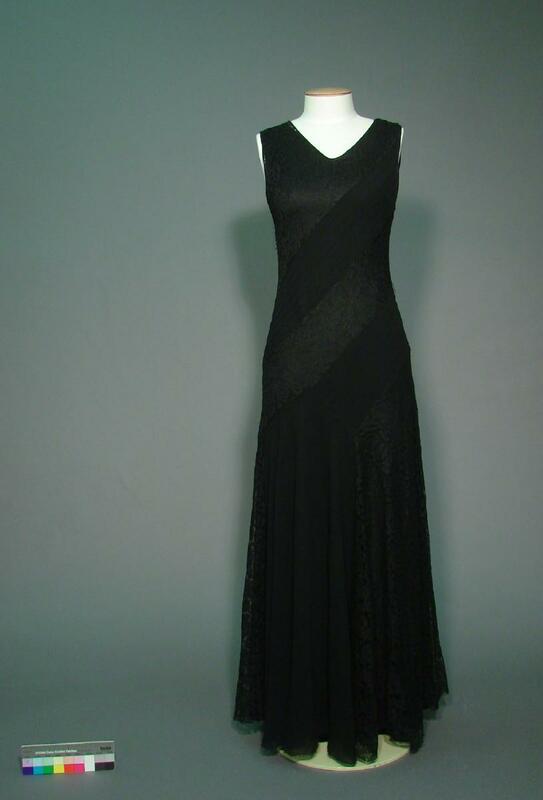 This dress belonged to Jean Woodhead who wore it in 1930 and donated it to the Museum in 1954. It is a full-length, sleeveless evening gown with a shallow ‘V’ neck. The combination of georgette and lace was very popular in the early 1930s and this dress is a great example of the effect that contrasting panels of the two fabrics could create. The dress is fitted through the bodice and skims over the waist and hips before flowing out into the full skirt. This drapes beautifully but would have swished and swirled as the wearer swept across the dance floor. The floral pattern of the lace sections contrasts with the diagonal sweep of the georgette, with its bands of very fine pintucking. The panel construction, with its geometric pattern, is mirrored front and back. Under the shoulders there is a tiny domed fastening to secure the bra straps of the foundation garment that would have been worn underneath. Jean Woodhead was born in Dunedin in 1901 to a farming family and grew up on farms in North Otago and Milton. She undertook general nursing training at Dunedin Hospital but then specialised as a Plunket nurse. She had a long career in Plunket, serving as matron to the Karitane hospital in Wellington during the Second World War, and as nursing advisor to the Plunket Society in the 1950s. She is remembered as an outgoing person with a good sense of humour and a lovely personality but Jean never married. Instead, like many dutiful daughters of her generation, she spent much of her adult life looking after her ageing parents. This dress, which she obviously treasured, recalls another side to her life – the svelte twenty-something who cut a dash at some long-forgotten Dunedin ball. Jean died in 1978 aged 77.